The Action Bible is a wonderful way to get kids to connect with the stories in the Bible on the visual level that they are used to. 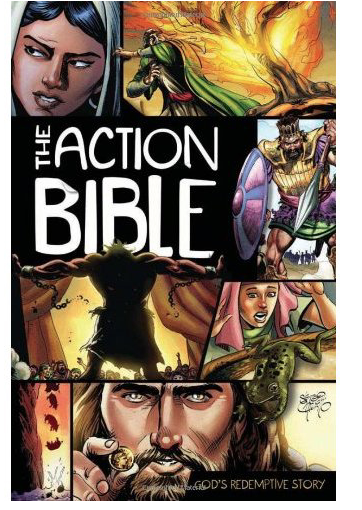 The Action Bible is not only one of our best selling books, it’s a true work of art. It takes a true artist to make the Bible come alive within the pages of a book an that’s just what artist and author Sergio Cariello has done. According to his official biography, Sergio Cariello was born in Brazil in 1964 and started drawing as soon as could hold a pencil. At the age of five, he already knew that he wanted to be a cartoonist. And so did everyone else–he drew on church bulletins, napkins, and every surface within his reach. He currently resides in Holiday, Florida. Sergio has worked for Marvel Comics and DC Comics. He attended the Joe Kubert School of Cartoon and Graphic Art as well as the Word of Life Bible Institute in upstate New York. The Action Bible includes over 200 fast-paced narratives in chronological order, making it easy to follow the Bible’s historical flow. The stories in The Action Bible communicate biblical messages clearly and forcefully to kids of all ages. Each page is filled with action-packed images and clear Scriptural references. This makes it a perfect gift for holidays, birthdays and more. Get your copy today at www.jmcremps.com.